It seems like reference previews are shown wrongly, only if you come from an internal link --> Is this a timing issue? Before checking this task again we should make sure that T215420 is done and merged. Lea_WMDE added subscribers: WMDE-Fisch, thiemowmde. This might be related to T214710#4914267, or might become much less of a problem after T214710 is solved. Let's make sure the fix is merged before we test this again. Lea_WMDE set the point value for this task to 8. I tried to reproduce this, without success so far. Is there anything specific I need to do or do we have a page where it reliably happens? Or does it seem to happen only randomly? 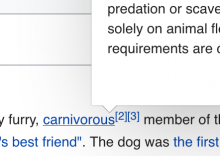 then hover over the first link "carnivorous" and from there straight to the footnote indicators coming after it, you should see the described behavior. The best idea I have so far is the ABANDON_END_DELAY, that defaults to 300 ms, and is used in a single place in the code: https://phabricator.wikimedia.org/diffusion/EPOP/browse/master/src/actions.js$266. I tried to set this to 1, and the issue seems to disappear. Unfortunately, we can not just change this delay because this will have a bad effect for users: all popups will disappear very quickly, much quicker than wanted. By the way, I can reproduce the issue on a page that contains a single link with a regular page preview. All I need to do is to quickly move the mouse over the link so it just briefly touches the link, leaves it, and quickly move it back on the link. If I can do this with said 300 ms, no popup will be shown. I wonder if this could somehow be related to T215194: [Bug] Pointer is incorrectly aligned for some references? @WMDE-Fisch, I can confirm this observation. The error descriptions we collected so far are so different, I believe we are looking at at least two different issues here. More specifically: I suggest to split the issue I described (quickly hovering the same link does not show a popup) off to a new ticket, along with the patch I uploaded. Per retro we are setting the ticket on stalled, to be rechecking the bug once we deployed to group0. @WMDE-Fisch is going to add some more info on bugs to be split up. WMDE-Fisch removed a project: Patch-For-Review. WMDE-Fisch added a subscriber: Andrew-WMDE. 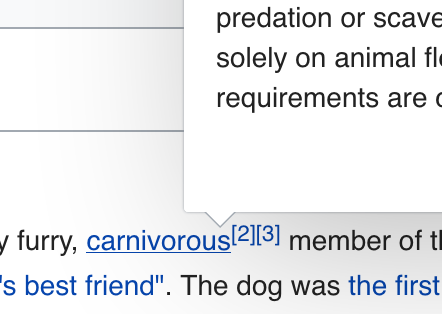 Tried to reproduce the issue on https://test.wikipedia.org/wiki/Dog, see the link to carnivore with the following refrences in the first paragraph similar to the same page on the English beta Wikipedia. I could not reproduce it there. @thiemowmde @Andrew-WMDE could you please try as well? WMDE-Fisch added a project: WMDE-QWERTY-Season-Sprint-2019-03-20. WMDE-Fisch moved this task from Backlog to Review on the WMDE-QWERTY-Season-Sprint-2019-03-20 board. Lea_WMDE closed this task as Declined. Lea_WMDE moved this task from Demo to Done on the WMDE-QWERTY-Sprint-2019-04-03 board.